It began with a march on the banks in downtown Hamilton, but an autumn day of rabble rousing culminated with hot coffee, car stereos and friends at a moonlit intersection in residential Grimsby, Ontario. We were twenty strong in a town of 20,000. It was one of the more interesting actions I’ve been to, not least because these things often take place in more urban areas. The quiet was punctuated by the periodic horns of vehicles whose drivers saw one of our signs: Honk against wage theft! A local Grimsby restauranteur has stolen the wages of a former employee and refuses to pay despite being ordered by the Ministry of Labour to do so back in January. We arrived at the restaurant, Portofina’s, with the intention of picketing outside and dissuading potential patrons, but Mr. Szanto beat us to the punch by preemptively shutting the place down for the night. No matter! 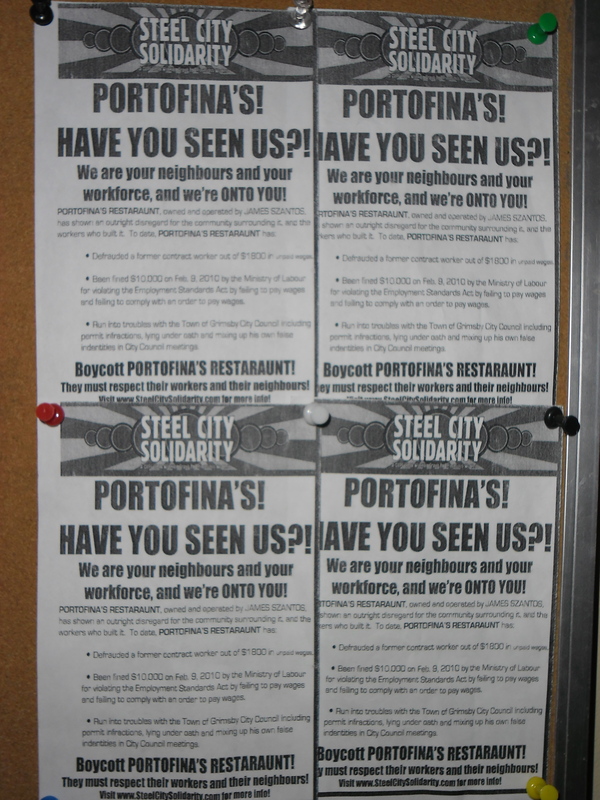 We picketed all the same, met other folks whose wages have been stolen by Portofina’s owners, chatted with the neighbours, and handed out flyers to cars stopped at the lights. Never have I seen such a warm reception extended to a group of protesters, and there wasn’t a cop in sight. Wage thief James Szanto still hasn’t paid, but Hamilton’s Steel City Solidarity network hasn’t lost a case yet. We’ll escalate. The process is direct action: bring together enough people and engage in creative tactics to pressure bosses into giving back what they owe. It may seem a simple step, but it’s a big deal to those who have been cheated in the hundreds or thousands of dollars and don’t have a union or other support with which to demand their rights. It also cultivates palpable (and reciprocal) solidarity. Admittedly, I’m gushing, but give a girl a break: it’s a demoralizing life for us anti-capitalists, even in light of the recent Occupy movements. “Who knew the revolution would start in Grimsby?” quipped a friend with a wink. It’s a pleasure to hear from you. I left another comment on the post about Nate, but I’ll certainly send you a longer email in the next few days! I actually live in Hamilton, not Grimsby, but it’s certainly not far! Funny how all these things come together, no? I’m glad you enjoyed the post. Please keep well. If you do hear of any more things specific to Grimsby, or in the area, let us know! I can always tap into the various networks in Hamilton, especially CUPE 3906, of which I’m a part.